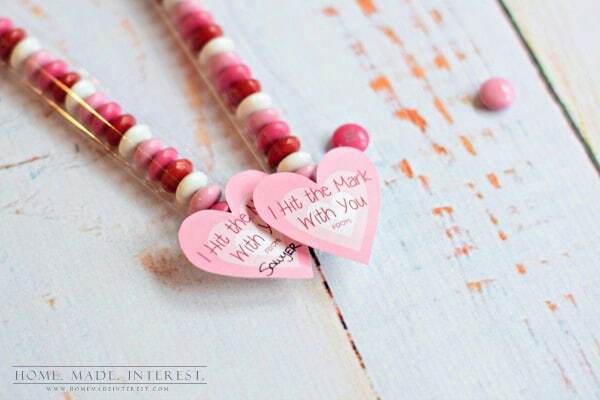 Hit the mark this Valentine’s Day with these simple Cupid’s Arrow Valentine’s Day Favors. Note: This post contains affiliate links, which means we may receive compensation if you make a purchase using the link. I love Valentine’s Day, not because I’m overly romantic, Rick and I don’t go all out for the holiday, but because Melinda and I always have so many cute, crafty projects we want to do, and recipes involving red velvet cake and chocolate that we want to make. 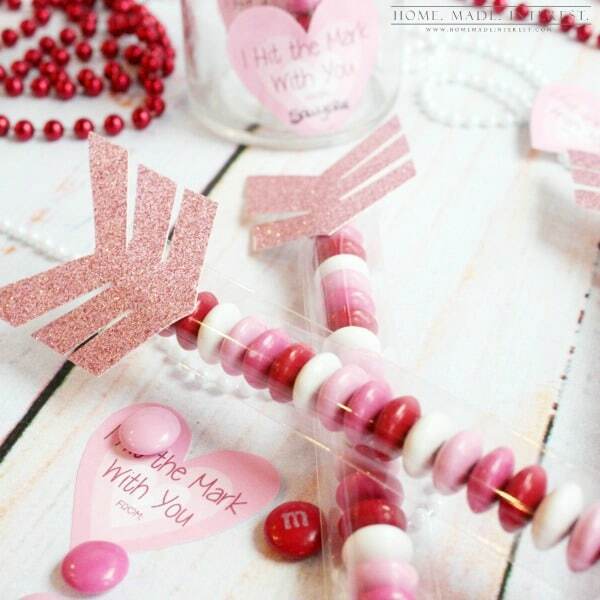 I don’t know if it’s all of the pink, or the hearts (or the chocolate), but Valentine’s Day inspires us to get creative! Over the weekend we worked on classroom favors for Melinda’s son to take to school. 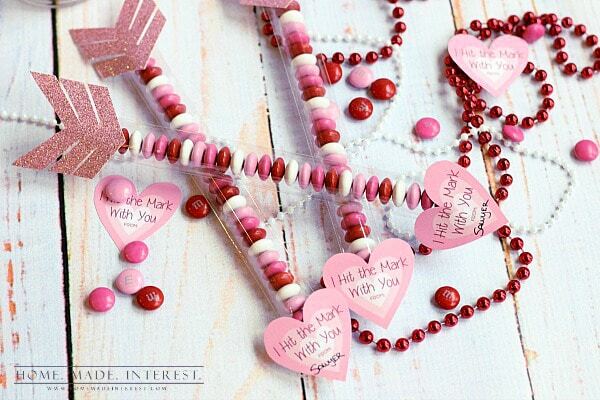 I’m totally digging the arrow trend and it fit perfectly with the holiday so we made Cupid’s Arrows, for Sawyer to share with his classmates. The first thing you do is fill your cellophane bags. We used a hard straw from a water bottle to push the M&M into place then we dropped the rest of the M&Ms in, alternating the colors. That first M&M is the hardest, once you get it in place the rest will fall in perfectly. For the arrow’s tail we cut 2″ strips from a 12x 12 piece of scrapbook paper and then cut the strips into 2″ pieces. We cut a “V” out of the top and made a point at the bottom. On each side we cut three slits, and then went back and cut a tiny piece off of the inside edge of the slits so it created a small gap. Then we attached the tail to one end with a glue dot. For the arrowhead we printed and cut out heart tags, and filled in Sawyer’s name under “From:”. We attached them to the other end with a glue dot. To save you some time we’ve even included the printable for you to download. That’s it, you’re done! We love how they turned out. Melinda is sending them to school with Sawyer on Valentine’s Day and I’ll be packing a couple in a care package for my niece and nephew so I maintain my Best Aunt Ever status ;). 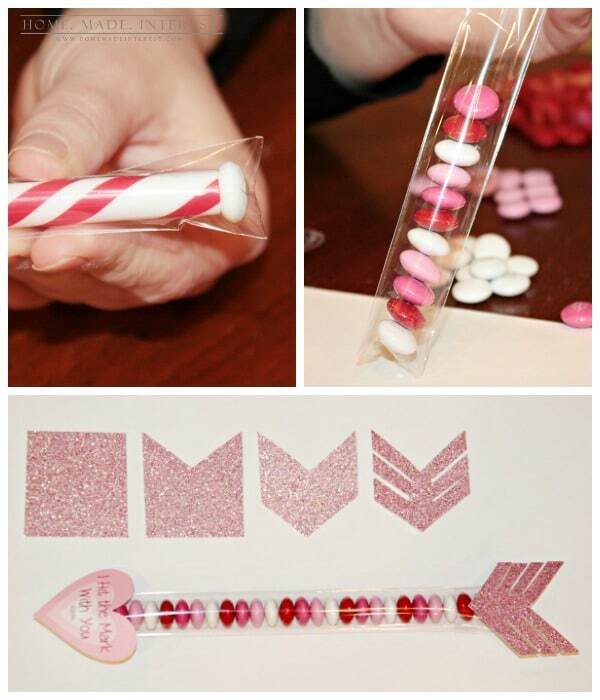 Don’t forget to check out our Valentine’s Day Pinterest Board for more fun ideas! Follow Home.Made.Interest.’s board Holidays- Valentine’s Day on Pinterest. Oh my darling! Also how did I not know they made cellophane bags that size!? genius! I love this adorable idea! Kat, this is absolutely my favorite Valentine yet for 2015! Pinned! 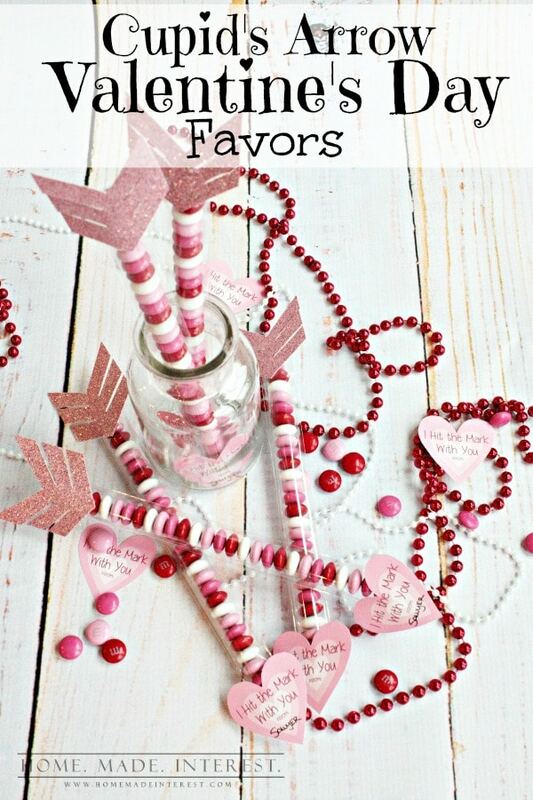 I think my little ones would love taking these to their friends on Valentine’s Day. These are really cute! Visiting from Motivational Monday! Thanks Karla, I try to make them easy to follow, it’s nice to hear that someone thinks I’m doing a good job ;). I just wanted to let you know that you are my nominee for the MEGA Rockstar from Creativity Unleashed Week 54! 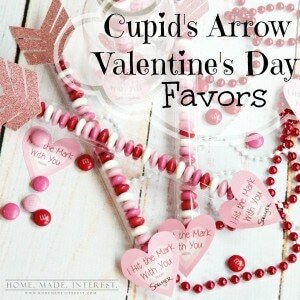 I adore your Cupid Arrow Valentine’s!!! So sweet, literally! If you win, all the host(s) will be sharing your project and loving you hard on Pinterest! Love these treats. I guess they could be played with for different holidays, too. Happy Valentine’s Day. thanks for linking up at Show Me Saturdays, you were featured on SWEET HAUTE Blog….hope you’ve stopped by this week’s party! These are fantastic!! What a fabulous idea! Muito lindo e o melhor simples de fazer, gostei demais, até eu posso fazer que não tenho tanta prática, ótima dica. i had tons of envolopes left used make arms ending hearts and legs. then attachede to valetine shape candys. hands feet where heart stickers. put dress or suit coats on them made park bench and used a ballon on stick fro street lamp turned out nice.